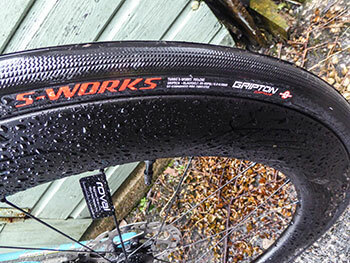 later this week will follow a thorough review of a pair of specialized roval carbon wheels, but the first order of business perhaps ought to be the s-works tyres that made them a practical reality on hebridean roads. because of the depth of the roval carbon rims (64mm), they are entirely impractical for use with any model of inner-tube of which i am aware. i have yet to find a manufacturer that would be keen to offer valve stems of around 100mm, to pass through those deep rims and still allow sufficient length on which to attach a track pump. as if to underline the diminished options, the rovals arrived with tubeless valves already in place. 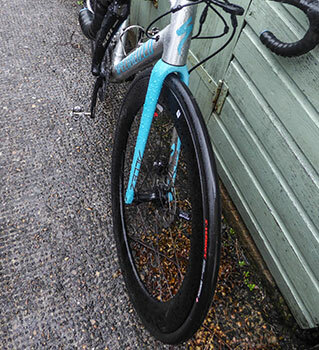 specialized, therefore, kindly supplied a pair of their 700x28c tubeless ready s-works tyres to avoid my scraping expensive carbon fibre all across the isle. it is those which make this a review of both good points and bad points. you may have read my disparaging dissertation on the whole tubeless genre last week, an outburst (by which i still stand) that was brought on by the agonising exercise of trying to fit the turbos to the roval wheels. had this been my first experience of attempting to inflate tubeless rubber, i'd probably have given up cycling altogether, particularly if i had actually paid for the wheels. in the absence of any compressed air, i have had relative success fitting tubeless tyres by offering a few exasperated and enthusiastic plunges with the track pump, blowing sufficient air inside to have the tyre seat itself against the rim flange. sadly, that was somewhat ineffective with front or rear turbos, though the front tyre did eventually give in to brute force and ignorance and inflate to a meaningful pressure. however, by afternoon, it had deflated itself to a pressure that even jeremy powers would scarcely have used for cyclocross. meanwhile, the rear tyre steadfastly refused to inflate at all, blowing bubbles of gloopy white sealant from the sidewall at strategic locations around the rim. to cut a long story short, it took two days to finally inflate the rear tyre all the way to 90psi (6 bar). even then, it has continued to lose about 10-15psi overnight, though that has scarcely interfered with the act of riding quickly around the principality. 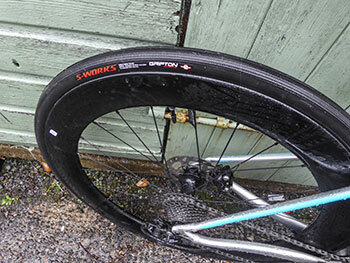 that said, contrary to a review on the specialized website, the tyres eased onto the rim without any undue difficulty. once again, it would be irresponsible of me to assert that this is a situation you're likely to experience yourself, should you purchase a pair of said tyres. there could be any number of reasons as to why the above results were observed, including incompetence on behalf of yours truly. however, on the couple of hundred kilometres i have enjoyed aboard the rovals, while shod with s-works rubber, they have given every reason for joyful reporting. it will, however, not surprise you that none of those kilometres have been dry. 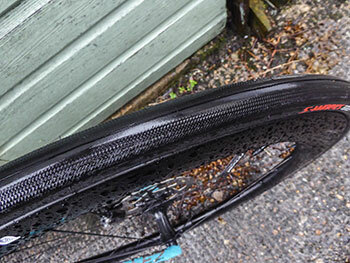 in fact, not only has the gripton tread successfully avoided dessication, it has had the added strain of remaining rubber-side down in the face of galeforce crosswinds. so far, everything thrown at them has been negotiated with aplomb. in fact, though i still harbour misgivings over the whole tubeless thing in the first place, this particular pair of tyres offers perhaps one of the closest comparisons with the ubiquitous tubular, only replacing glue faff with sealant faff. once successfully fitted, there is little chance of the specialized tyres separating themselves from the rims. this i know because i have thrown myself with reckless abandon across uncouth roads kept for special occasions, including a smattering of less than pristine cattle-grids. i don't know if many of you have attempted to take a tight corner on deep-rimmed wheels, when hit sideways by a galeforce gust. if not, please do not apply here for a recommendation. there's every likelihood that the fact i can still type from my armchair rather than a hospital bed can be squarely attributed to the s-works turbos. though common practice on this side of a calmac ferry route would be to fit an inner-tube, should a puncture be suffered in the course of one's duty, as mentioned above, i do not possess a tube that would fit the roval wheels. thus, one of the three rear pockets is home to a tubeless compatible puncture repair kit, a small package i hope never to have need of. it has long been my contention that there is nothing more pointless than standing at the side of an islay road in the rain attempting to find the hole in an inner tube. i can't see how that situation would be any different with a tubeless tyre, even in the dry, given the amount of white gloop sloshing about inside. how would i ever get a patch to stick? all that being said, this is rubber that could easily convince me that i possess a similar power output and bike-handling skills as peter sagan. if you've ever seen me ride, you'd realise just how impressive that is. specialized's s-works turbo tubeless ready tyres are available in several different widths (700x28c reviewed) in black only at an rrp of £70.